GUITARIST/VOCALIST DAVID M’ORE TO PERFORM THE NAMM CONVENTION IN ANAHEIM CALIFORNIA. The NAMM Convention, a yearly event that draws thousand to the Anaheim Convention Center taking place this January 21st, 2016, a five day event that includes free concerts, after parties and moments to meet and greet with Music Industry’s top people, top names and more. Hundreds of instrument manufacturers, record label executives and more, all in one place. Artists old and new will be seen inside and out, looking to meet and connect with fans of all ages in a free for all of history making moments. This year, another historic event will be taking place, David M’ore will be there to entertain the world. Straight out of San Francisco by way of Argentina, musician David M’ore has blazed a path of quickly-growing recognition that’s landed the guitarist-vocalist on the cover of, among others, the San Francisco Chronicle. M’ore’s new album, Passion, Soul, & Fire is described by one reviewer as, “twelve tracks of high-octane blues-rock that smolders with salacious bass grooves and really irresistible beats…add a few portions of electrified sexually-fueled rhythm and blues with some smokin’ guitar licks that spellbind the mind, all the while creating mesmerizing sounds of Classic Rock. M’ore’s throaty vocals are reminiscent of great soulful rock legends such as Billy Gibbons, Warren Haynes, and the late, great Lemmy Kilmister”. David M’ore managed to take his guitar pyrotechnics to a different level of instrumental majesty. Performing on a custom-made Strat carefully modified to his specifications, the guitarist demonstrates his acclaimed six-string technique on both originals and cover tunes. 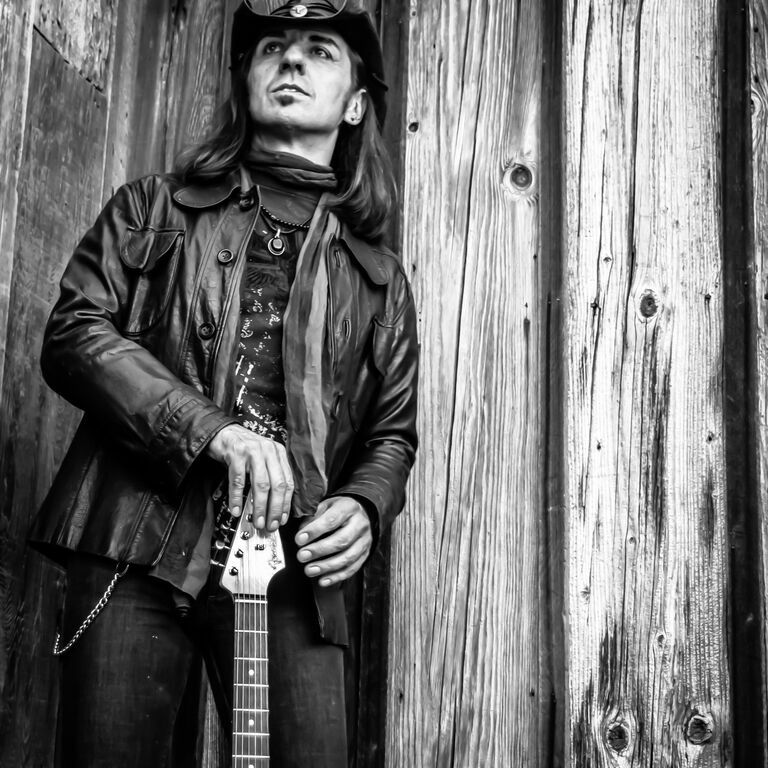 “I love to pay tribute to those who influenced me, but at the same time, I like to be true to who I am” explains M’ore, whose influences include guitar greats Jimi Hendrix, Ritchie Blackmore, Joe Satriani, Johnny Winter, and Albert King. From the beginning, traditional Blues and British Neoclassical Hard Rock played a very important role in the evolution of the David M’ore style. Born in Argentina, he picked up an old guitar that his Godfather bought him for his eighth birthday and immediately began to explore vintage records. “The aggressive sound of the guitar drove me emotionally insane”, M’ore says. “I still listen to those old records from Johnny Winter. That’s where it all began”. A born troubadour, M’ore frequently moved around the world as well as throughout the U.S. before finally settling in Hollywood in 1990. After the split-up of his band Blind Hole and his refusing to accept the oncoming Grunge Movement, M’ore escaped to Sacramento in 1993, winning a Sacramento Music Award there in the process. If you’re a fan of excellent guitar playing and enjoy hard rock that strays towards the blues rather than heavy metal, it is likely David M’ore’s expressive and explosive guitar attack is for you. David M’ore, a man and his guitar. IndiePulse Music Magazine will be posting an in depth review of his newest release, Passion, Soul, and Fire released this year. So check back soon.